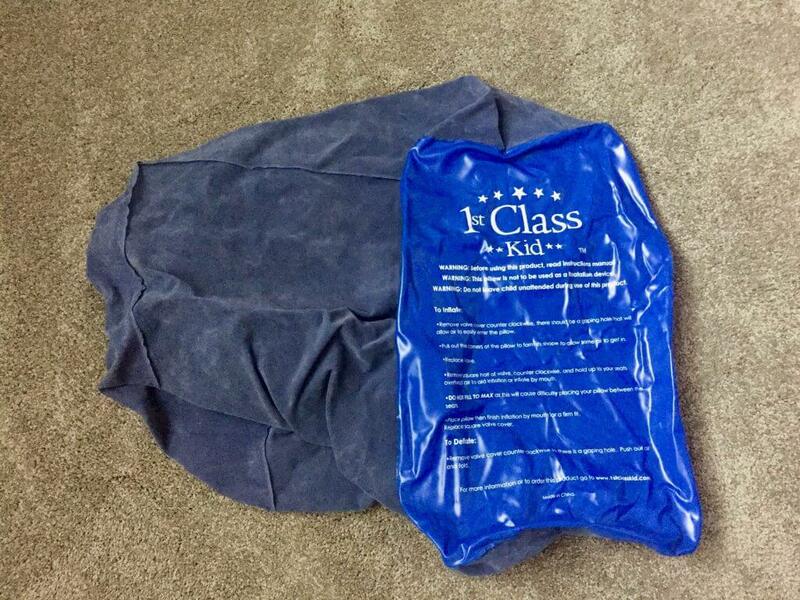 The 1st Class Kid Travel Pillow is an inflatable pillow that easily fits in a carry on bag. When deflated, it took up minimal space in my backpack. It fits on the floor of an airplane in between the passenger seats. Interestingly, it’s designed so young children can spread out to sleep, rather than lie across other accompanying passengers or on the floor. 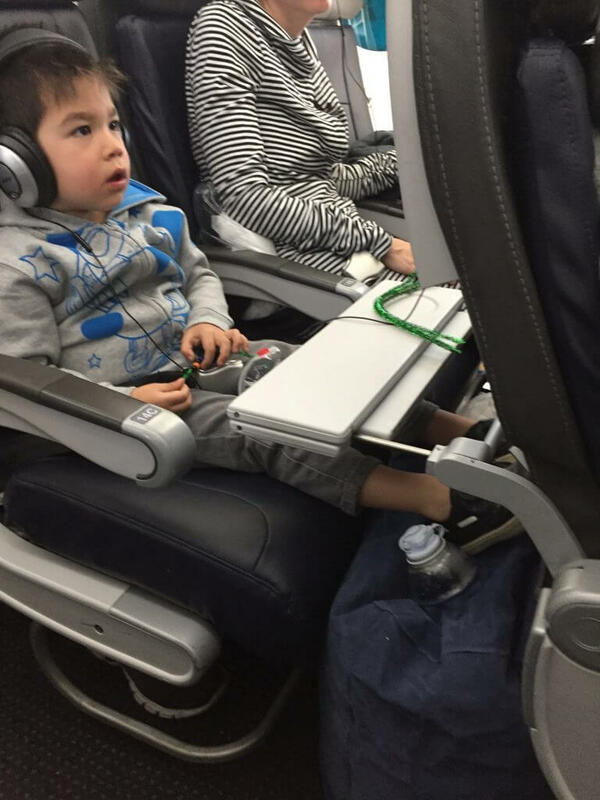 With his headphones, movie and 1st Class Kid Travel Pillow, our preschooler was set up for a successful flight. 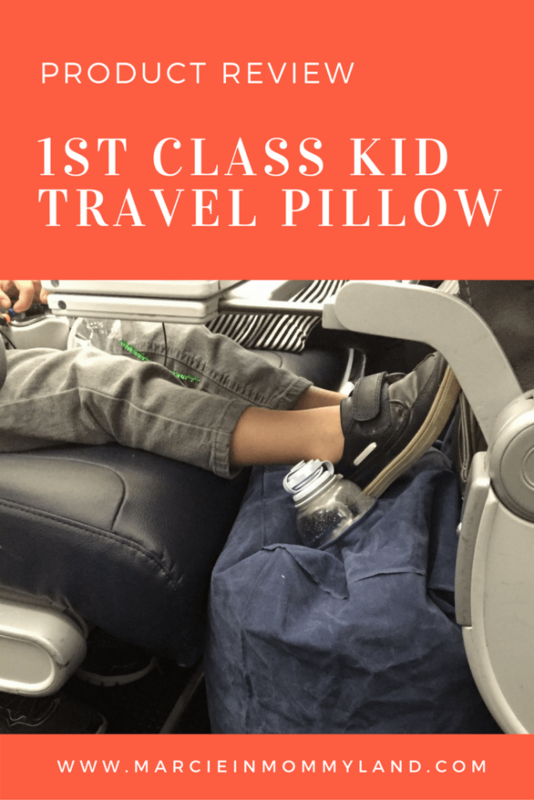 We tested out the 1st Class Kid Travel Pillow on our flights from Seattle to Madrid. This was our son’s first international fight in more than a year and we weren’t sure if he’d be able to sleep comfortably, as he’d grown. Our flight left at 7pm and we decided to re-create our son’s bed as much as we could. We were unable to use the air vents to inflate the pillow, so my husband blew it up manually. We put it in front of our son’s seat and brought out his special blanket. However, it took awhile for him to fall asleep. He was very excited for our trip and to be on an airplane. But, eventually he stretched out on the pillow and slept. For our flight home, it left during the afternoon and we didn’t expect our son to sleep much. But, we had a long flight from Paris to Chicago and we figured we’d try out the 1st Class Kid Travel Pillow again. It was even more helpful this time! Our son was able to lounge comfortably while he watched movies. Finally, he quickly fell asleep for a really long nap. 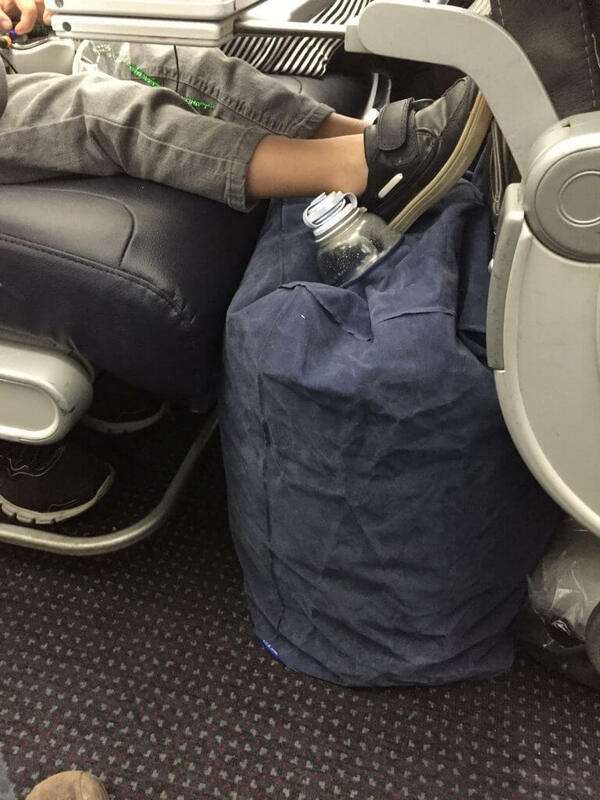 The 1st Class Kid Travel Pillow made it impossible for our son to kick the seat in front of him. 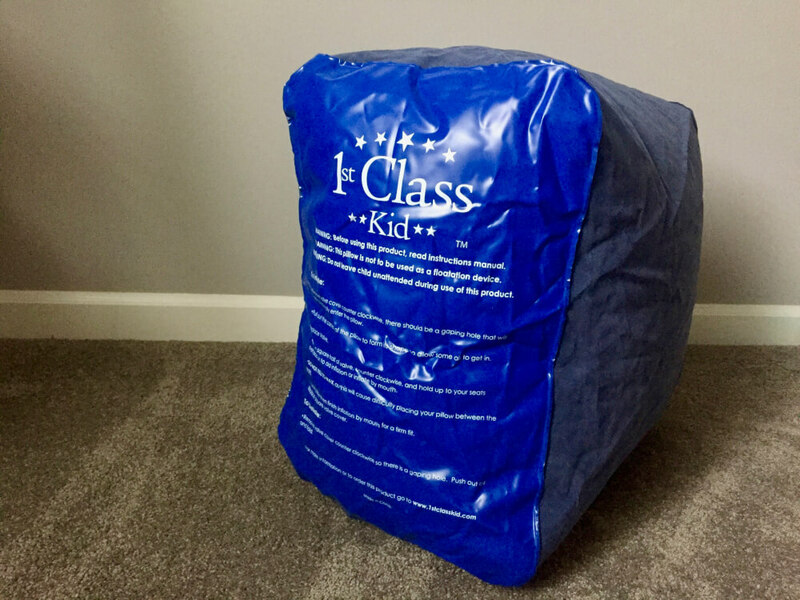 What my husband and I appreciated the most about the 1st Class Kid Travel Pillow is that it prevented our 3-year-old from kicking the seat in front of him. His legs rested on the pillow and didn’t have the opportunity to swing. My husband and I didn’t worry about our son bothering the passenger in front of him! Additionally, I rested my feet on it at one point during our flight. I angled myself in my seat and my son and I both rested our feet on the pillow. I’ve used my carry on backpack as a foot rest in the past with minimal success. The 1st Class Kid Travel Pillow surprised me with how comfortable it was. I also didn’t worry about crushing anything in my carry on. 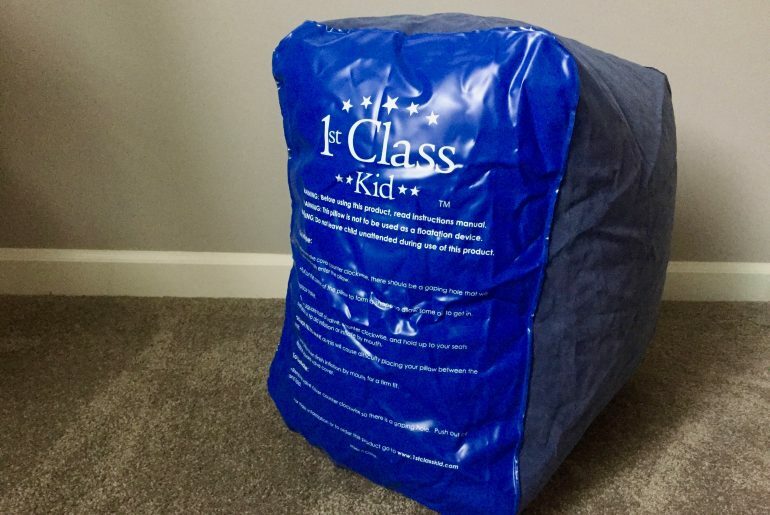 The 1st Class Kid Travel Pillow is easily packed because it folds up. Travel Pillow to families with small children who are heading on a long flight. Additionally, it takes up minimal space in a carry on bag and was easy to inflate. It prevented our son from kicking the seat in front of him. He was also able to sleep well on our international flights. We will be bringing this on any flight long enough to watch a movie. 1st Class Kid Travel Pillow sent me this product for review purposes. All opinions are my own. How cool! I know I would love this myself! I am always looking for something that makes flying more comfortable. Have you seen Delta’s new flying suites? What a cool idea. I dont travel often with my kiddos, but this is such a good idea. I will have to share with my friends who travel often with their kids! We don’t fly at all, but I think this would even be great in the car! My daughter is constantly trying to pull her feet up in her seat with her, but she isn’t quite tall enough to tuck them under. This would be a great option for her! I’ve never thought of getting a travel pillow for my children, but they’ve never been on an airplane. If we take a flight, this would be a great idea. What a really interesting and effective invention this pillow is! I can see how it would make travel so much easier and more comfortable for kids! This is seriously genius! Airplanes companies should carry it. I am not a parent but I have sat in front of a child before on a plane and while it was frustrating for me, I know it was ten times harder on the Mom who was doing her best to not have other passengers angry at her. I haven’t heard of this before, but it sounds awesome! Having something for your kids to rest their feet on would be wonderful, especially for the passenger sitting in front of those little swinging legs. I will have to check this out! While I don’t have any small kids, I do travel a lot. I have been looking for a small pillow to use when I travel on a plane. This may be exactly what I have been looking for! This pillow is genius. I kind of wish they made something like this for adults. It’s nice to see kids have an option for spreading out in their own seat while still wearing their seat belt. This is actually amazing and would definitely help flying with the youngsters, especially when longer flights can be a real pain. I had no idea they even did these! Traveling with kids can be such a struggle sometimes. This looks like the perfect product to keep them comfy! That’s a nice pillow for the kids! I love that it’s easy to store and take with you! It’s definitely something that you want in your bag especially for long flights. How cool is that?! I’m totally bookmarking this for our summer travel plans! My kiddos need one! Did it take forever to blow up? This is a great idea but seems a little cumbersome. Thanks for the thorough review, I’ll pass this along to my toddler mom friends! No, not really. You can hold it up to the air vent, but we just blew it up manually. This is such a cool idea! I’m not sure how much I would like to deal with the bulk but I could totally see why this would be so appealing for parents! This is fantastic! I’ve taken many flights with kids and this would definitely come in handy. Yes! I was a bit skeptical at first but was really surprised how much my 3yo enjoyed it! What a great product for travel! My youngest daughter really wants a pillow everywhere we leave our house…what a great thing to be able to use for her! Ooh I need this! We are always traveling ad this would be great! Do all airlines approve this? I know they can get super picky sometimes. If they do I’m getting one today! What an interesting idea! I’m sure the person in front of your son appreciates it 😉 anything you can do to make those long haul flights comfortable makes a difference ! This travel pillow is a great product to have for kids. It is also great for really short adults. We haven’t flown with the entire family yet..no kids. But, this looks like it could be great for the kiddos. This seems like a really great idea! Its handy that it doesn’t take up too much space and I bet the passengers in front of you appreciated the no kicking of the seat! This looks like it would be so handy for our trips. I am going to have to look into getting one! Thanks for the heads up! My kids need something like this the next time they travel. It would certainly come in handy! It was really handy and folds up quite small! Glad to help! My Mom just flew up from Hawaii where there was a little girl who kicked her seat the entire way. I told her it’s a shame that girl didn’t have a 1st Class Kid Travel Pillow!